We have just launched our Sustainability Learning Guide, it is based on Habitat the Game, and has been designed to engage and inspire students, teachers and the wider community to play Habitat and take personal and community actions on sustainability. This guide is a dynamic and interactive resource that can be used to extend sustainability actions beyond time in the classroom and while looking at screens. It has been created for years 3,4,5 and 6. The methodology used to develop the Guide included collaboration from a wide range of stakeholders including teachers, students and environmental educators from Australia. It links to the National Australian Curriculum. Many of these activities have been inspired by existing materials created by the BBC, NatGeo, The Coal Loader Sustainability Guide and NASA. This guide can be used as a 10 week unit or individual plans. When using the individual plans it is valuable to download the whole learning guide below. 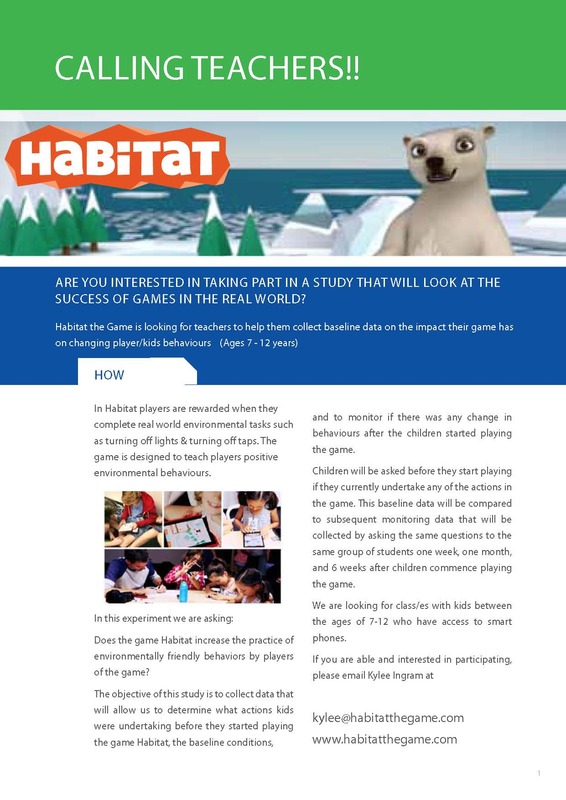 Habitat the Game Learning Guide – offers a full Version of the guide that includes all of the Lesson Plans. Can a game change behaviour? Does the game Habitat increase the practice of environmentally friendly behaviors by players of the game? Does the game Habitat encourage children to spend more times outdoors? I look forward to hearing form you. Base line data collection is fun!